Not everyone has yet heard of Chrislam — I certainly hadn’t until I bumped into it on the Net while looking for something else — so I thought I’d pass on what I’ve learned so far. Try searching for ‘Chrislam’ yourselves and you’ll come up with enough to write a book, let alone a short article! So, what is it? Well, as you might guess from the word, it’s a merging of the religions of Christianity and Islam which was started some decades ago in the West African nation of Nigeria. A pastor named Shamsuddin Saka, who had a small church on the line between Nigeria’s Muslim North and Christian South, decided to try to bridge the gap and preached a liturgy which blended both faiths. He taught that Christians and Muslims are both children of Abraham, which is correct according to both the Bible and the Koran, and that they should, therefore, live in peace. Nevertheless, it seems that after some time, the idea — perhaps you could say, the religion — of Chrislam began to appear in the United States of America. In 2006 President George W Bush, when interviewed by the ABC News, said he believed that both Christians and Muslims worshipped the same God. In 2007 a group of Muslim leaders published a letter entitled ‘A Common Word Between Us and You’ urging peace and justice between Muslims and Christians. During a prayer at the inauguration of President Obama in 2009 Rick Warren, the well-known founder and pastor of a Community Church in California, referred to ‘Isa’, the Islamic name for Jesus and was later said to be largely responsible for the spreading of Chrislam throughout American churches. That year he also addressed the annual convention of the Islamic Society of North America urging cooperation between the two faiths. In 2011 a group called ‘Faith Shared’ encouraged Christian communities to organise events where Muslims were welcomed into their church, Priests and Imams read from each other’s sacred texts and children in Sunday School were taught the sayings of the Prophet Mohammad. Some eighty churches agreed to sponsor interfaith services at that time and since that was seven years ago, it is quite possible that many more churches now host Chrislam and have both bibles and Korans along the pews. And it has certainly spread across the Atlantic. Sweden started the slide towards Chrislam in 2011 when just before being appointed, the current Archbishop when asked “Does Jesus convey a more truthful image of God than Muhammad does?” surprisingly, did not immediately say yes, but instead involved herself in a long monologue about there being many ways to God. In 2016, for the first time during a Mass in Italy, a verse of the Koran was recited from the altar. In England, many Churches of various denominations now hold interfaith services. In fact, in 2015 a leading liberal clergyman allowed a full Muslim prayer service in his church in Central London, even joining in the event by reading a passage from the Koran and asking the congregation to praise ‘the god that we love, Allah’. Church of England Bishop Harries even suggested that Prince Charles’s coronation service should be opened with a reading from the Koran. But it was the 2017 Christmas season which showed the remarkable growth of Chrislam in Europe, with efforts to both secularise and Islamise Christmas. For instance, the traditional Winter Markets in Germany were renamed ‘Winter’ Markets, so as not to offend Muslims. And it was in Germany that a Christmas School party was postponed after a Muslim student complained that the singing of Christmas carols during school was ‘incompatible with Islam’. In Skien, Norway, recent festivities included verses from both the Bible and the Koran which referred to Jesus/Isa. Ed – This is part one of a two-part article. The second part will be published tomorrow. After Brexit: it’s our fish! ‘A Common Word Between Us and You’ urging peace and justice between Muslims and Christians. Thats going well isnt it. Islam can not be modified in order to accommodate Christianity, because to do so would be an act of blasphemy and apostasy. It’s ‘The unalterable word of Allah’ as expressed by the Quran or nothing, because Islam does not, and can not, bend. Any devout Muslim who plays this game can only be performing it as an act of deception. Contrary to the popular myth, Islam is not an Abraham religion. Mohammed reinvented ‘Allah’ the moon-god of his family’s Pagan religion, elevating the deity to “the one and only god”. After plagiarising a few features of Judaism, he thenceforth used his newly invented ‘religion’ as a means of coercion and political terror. I won’t reference the title of this article because I find too nauseating but it really is what all the war and chaos we’ve seen over the last centuries and today has been and is all about though few of the protagonists would have understood. 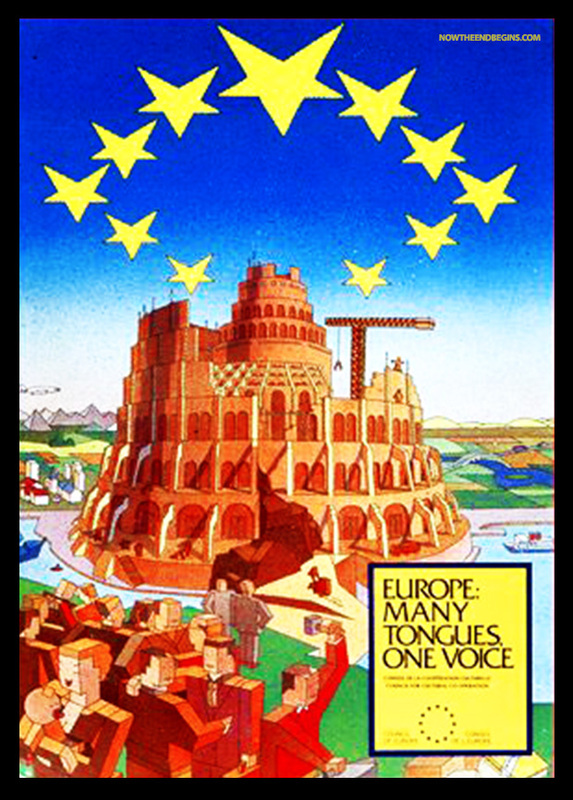 The ‘ordo ab chao’ strategy as masons call it, has been used to get the West to the point where such suicidal ideas can be contemplated, the forcing through treachery and Hegelian fear of Europe into a union with its nemesis. According to ex Jesuit (a corporate re-branding of the suppressed, for the adepts, anti Christian, Templars, with their major ‘shareholders’, the Assassins, et al) priest, Alberto Rivera, Islam was created to destroy Biblical Christianity by – sorry to you devout RCs – Papal Rome and Mohammad selected for brainwashing, as having the right ‘stuff’ for the purpose. , mocking the profane with its occult symbolism, eg: inverted stars, cube headed people. As the Bible reveals, it’s not about money; ‘they’ control the money system and can conjure as much of it as they like through international banking, but ‘Mystery Babylon’ in whatever guise it manifests. The anti Christian nature of the fascism of Franco and National Socialism can be seen ties with Islam and ‘digging a little’, Saturnalia (the pagan Roman origin of Christmas) is seen in the esoteric meaning of SS (nominally: protection staff) but really ‘Die Schwarze Sonne’ Black Sun or Saturn (or Chronos, etc.) who/which is iconized in the form of the black cube – as revered in Mecca. Behind the scenes, the usual suspects, such as Warren (mentioned) and ‘we must change’ Blair, working for their masters, are promoting ecumenism so that we can all be fashioned into neat little obedient, impoverished ‘cubes’ for the benefit and amusement (in the most despicable ways) of the ‘elite’. A bit of further info. The last video would seem a bit far fetched for some, but consider that we’ve had ad recent Prime-Minister known as ‘Oinker’ that had some strange sexual habits with dead pigs and it doesn’t seem so far fetched. HOW THEY SPEAK IN SIGN LANGUAGE! Alex Jones says that Kubrick died very shortly after making ‘Eyes Wide Shut’ – haven’t seen it but some of it was cut as it was too revealing. Many of the ‘stars’ appear to be in mind control programmes (eg: MK Ultra) as there are clips showing them suddenly , bizarrely switching personalities with no explanation (other than some unknown trigger signal being accidentally invoked). Not that many of the lower levels will be aware of the more disturbing aspects of Masonry (no wonder they’re pushing censorship) , but it is important to understand that it is one branch of the power structure (people seem to get obsessed with “it’s the this or the thats” and miss the ‘big picture’) ) and it too is under control (and apparently infiltrated, as the main stream churches). Re. Masonry , it is interesting to note that Albert Pike’s ‘Morals and Dogma’, when discussing the Bible, Pentateuch and Koran – says that ONE of these is the light by which the Mason must walk (or something) – the suspicion is that it’s the latter of the trio. To hell with Islam in all its forms. Such attempts at merger are simply the thin end of the wedge to Islamisation. The clergy from Welby down should be sacked for their dangerous sympathies. Like erdogan’s musing on democracy “you get off the train when it has reached your destination” I wouldn’t trust anyone hoping to get Islam on board with Christianity and then hoping to keep the pluralist train running. There was a piece in our local paper about a school trip (14 year olds) to various places of worship: Gloucester cathedral and Gloucester mosque. The kids reported that they preferred the mosque, which was “simpler”. In a fearful and short-attention age, simple submission may be preferable to the complex and mysterious liberation of Christianity, not to mention the burdensome iconography and physical history a cathedral embodies. What kind of Christianity would appeal to the kids though? Submit to the authority of Rome, or go communist and restart from St Paul? ‘Simpler’? I’m not particularly religious but the glory of British cathedrals – including that at Gloucester – stirs the soul. How were our forebears able to conceive of and build such breathtaking structures? To stand at the transept in York Minster and look skyward is simply awe inspiring. What heritage. I am a Christian and respect all faiths. But how many Mosques have allowed a Christian service inside? Do we actually know what on earth we are playing at here? Im sorry, if you want to keep our Christian culture, its time to start standing up for it. .Janice You certainly cannot expect the Church of England to do that – quite the reverse in fact – and I don’t see the public clamouring for a John Wesley to challenge the status quo. If it is to be saved it can only be done through small independent Churches – Lambert Palace is a hot-bed of liberal-left loonies hell bent on ……..Chrislam. I fail to see why any intelligent conscientious empathetic person should need either Christianity or Islam. I think we do need Christianity. Our civilisation is built on it, and I really do think we will descend into barbarity if it’s destroyed, leaving a vacuum. I’d be careful what you wish for. PS Moral relativity is a very slippery slope. for the last ten years it has been known as, PISLAM!!! PAEDOPHILES UNITED!! !